Advanced Dermatology & Skin Cancer Center (Fayetteville) - Book Appointment Online! 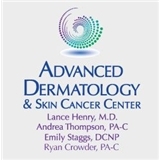 Advanced Dermatology & Skin Cancer Center is a comprehensive cosmetic, medical and surgical dermatology practice led by Board Certified Dermatologist Lance Henry, M.D. Our offices located in Fayetteville and Bentonville, Arkansas offer a state-of-the-art laboratory and skin cancer treatment facility, where our providers offer a variety of exceptional dermatologic services at your convenience. Revive Medical Spa embodies a contemporary environment that offers the best in aesthetic skin care treatments. Upon entering our doors, you will quickly begin to enjoy our calming and inviting accommodations. You will immediately relax and prepare to become renewed, rejuvenated, and revitalized. Very professional staff, I felt very safe with my health. I really enjoyed my visit with Emily Staggs and her staff. They were very nice to my children and I, which is always incredibly important to me. Emily was professional and made sure my issue would be followed up to ensure the treatment worked as well as to make sure it won't return. The last Dr. Who treated it did not make the same efforts, only for it to return shortly after. I was very pleased with there office and would recommend it to anyone in need of a good dermatologist office.